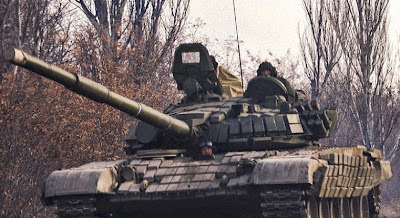 DONETSK, Ukraine -- Stop us if you've heard this one: Russian tanks, armored personnel carriers, and heavy artillery cross the border into Ukraine, accompanied by Russian soldiers in uniforms without insignia. That happened yesterday, November 12, 2014, but only in the sense that it was reported by NATO. And in response to this supposedly new military situation, the Russian Defense Ministry just announced that it will begin conducting long-range bomber flights in the Gulf of Mexico, Caribbean, and eastern Pacific. Ukraine has been complaining about this very same Russian incursion into its territory for days. And, really, you'd be forgiven for losing track and losing count of the number of times this has happened since insignia-less Russian soldiers—nicknamed "little green men"—first appeared in the Ukrainian peninsula know as Crimea back in February. Since Putin launched his so-called hybrid warfare against Ukraine last spring, the number of such incursions has been fluid and hard to count—and that's by design. It is supposed to be difficult to track and, more importantly, to punish. How do you deal with Russian "volunteers"—hundreds of Russian soldiers who were forced to take vacations while being sent to fight—and "humanitarian convoys" that seem designed not to deliver aid, but to test the weakness of the Russo-Ukrainian border? Well, according to the Western press, this shows that the September 5 ceasefire agreement, signed by the Ukrainian government and Ukrainian separatists as the West breathed a collective sigh of relief, is now "collapsing." Since its signing, the accord has been "battered," "doubtful," "strained," "shaky," and "crumbling." Two days ago, Washington told Moscow to obey the truce. Today, Moscow told Washington to do the same. Consider this November 9 headline, from the Financial Times: "Heaviest Shelling Since Truce Renews Ukraine War Fears." Where lies the line between shelling that violates a ceasefire, and shelling that doesn't? Almost since the day the truce was signed, it was violated. Not once, not twice, but constantly, in a grinding routine of shelling and blood. 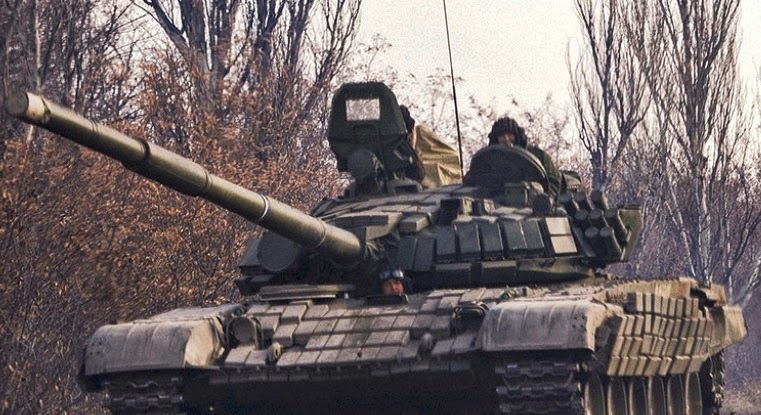 By early October, one month since the Minsk agreement, the U.N. reported that 331 people had been killed in the continual fighting in the Donbass region of Ukraine. On the eve of elections in the self-proclaimed separatist republics, seven Ukrainian soldiers were killed. Two days prior, another seven were killed in action. This "ceasefire" has not been in place—formally or informally—for months. By the start of October, the situation was so dire in southeastern Ukraine that the Ukrainian military downgraded to a "period of quiet," in which fighting would only be halted after 6 p.m.
To say that NATO's latest announcement about Russian troops "pouring" into Ukraine signals the end of the ceasefire is to misunderstand this conflict. Ukraine has spent the past few months unravelling: the government is running out of support (and funding), oligarchs continue to defend their enclaves in the east like so many feudal princes, and the Ukrainian military, even as it "redeploys" troops to the east this week, is increasingly unable to stave off rebel attacks—that's why the ceasefire was agreed to in the first place. Why has the West insisted on talking about a ceasefire that went up in smoke as soon as it was signed? Because the West is tired and bored with Ukraine, and with long, messy wars in small, distant countries. Europe is not particularly eager to bring a penniless, corrupt country that has become a warzone into its embrace. The White House has been distracted by ISIS and Ebola and the GOP. And both Washington and Brussels are out of options. Rachet up sanctions against Russia? German Chancellor Angela Merkel just ruled that out. Arm the Ukrainians with lethal force? Putin will just do what the West does, plus one. As the Ukrainian army mobilizes for what will likely be a much more open conflict with Russia, the West will find itself hamstrung once again by its understandable lack of desire to get more involved. Putin wants to carve up Ukraine more that the West wants to exert itself to keep a broken vase glued together. Obama, for one, has said as much in private. And Putin has made clear what he wants. Last month, speaking to foreign Russia watches at the annual meeting of the Valdai Club, Putin was asked about whether he questioned the sovereignty of Ukraine. He said he didn't, but questioned its modern borders. The east, he said, was historically Russian land that was forked over to the Ukrainian Soviet Socialist Republic in the 1920s "to increase its proportion of the proletariat"; the west was carved off from Poland after World War II. Ukraine, he concluded, was "a complex government invention." Putin intends to dilute the Soviet creation with a bit of his own restorative realism, and in the end he will take the Donbass, just like we predicted back in March.